The choice is to send bodies in available body bags and others in locally available material or wait for body bags to arrive. The nation lost seven brave sons on 7 October in a tragic Mi-17V5 helicopter crash, around two kilometres from the Indo-China border—five air warriors and two jawans. It could not have been more poignant that it happened just a day before the Indian Air Force (IAF) celebrated its 85th anniversary. 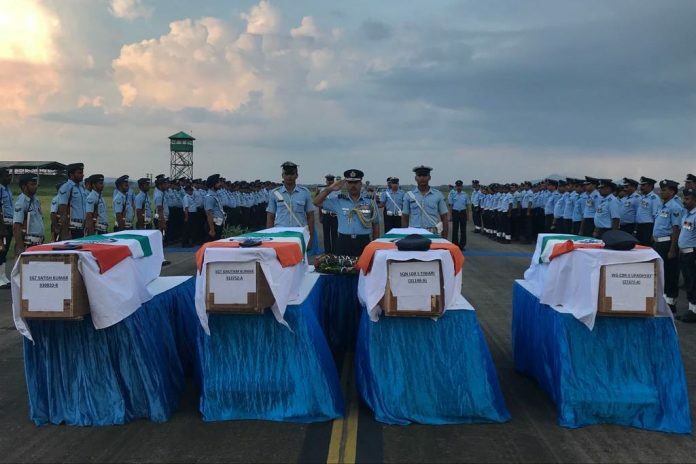 There were many tweets talking of the celebrations ‘under the shadow of the accident.’ But it must be remembered that as per IAF’s credo, after the rituals conclude, the Commanding Officer is the first to get airborne to signify the undying spirit of the IAF —as a tribute to the departed. Then came the scintillating aerobatics after the ceremonial parade at Hindan —and social media rightly went into raptures. All this soon came crashing down when photos started appearing that showed bodies of the helicopter crash personnel having been transported, wrapped in cardboard packing and not in body bags/coffins. As a helicopter pilot, I have had the misfortune to do some such carriages from the border, and it is only correct that the common man gets the right perspective. First, any right thinking person would take offence at the sight and wish that such ‘disrespect’ should never take place. Second, no uniformed person would ever disrespect his comrade’s body. This is an oxymoronic situation since the last remains would have been collected and arranged for transfer by uniformed personnel from that border post— the very personnel for whom supplies are being dropped by the helicopter. Put yourself at that post in an army man’s uniform. The aircraft is on final approach, the aircrew checks dropping zone is clear and commences the drop. The jawans on the ground see the approaching helicopter, which swings to the left (if the reports of a problem in the tail rotor are correct), crashes and catches fire. Those jawans, at that 14000 ft altitude post, would have sprinted/crawled to pull out their comrades from the burning wreckage— but alas, none came out alive, only their mortal remains. The jawans would have used whatever dignified material they had to encapsulate their comrades– because there are no body bags available at each post. A wireless message back to base would have activated the crash plan of an Air Force Station standing by for Search and Rescue (SAR) duties. A Dhruv Advanced Light Helicopter was launched post-haste, especially since the first reports said that there were two survivors. The reality of the situation would have hit the aircrew of the SAR helicopter on landing— they did what was expected of them and that was to bring back to the Base Hospital at Guwahati, their comrades who were ‘embalmed’ by their army brethren. The Base Hospital is where facilities are available for post-mortem and proper and scientific embalming. We saw photos of coffins of our dead warriors draped in IAF and Indian Army flags being given a befitting ceremonial salute and then being sent by a C-17 Globemaster to their near and dear ones. Then came the unpalatable photos of the intermediate carriage from that inhospitable border post to Guwahati. The mortal remains must have been secured by our jawans with all due respect and care and their sentiments should never be doubted. If they had body-bags, it would have enhanced the dignity of the carriage – and this is something that the government should look into post-haste. The tricky situation is: how many body-bags at each post? What about catering for civilians close-by in case there is a natural calamity and the Army is called-in to help? What if the number of casualties are more than the body bags? Wait for them to be brought and then send the mortal remains? But, flying in the inaccessible areas of North, Central India and North East generally stops in the afternoon due to weather-related turbulence. So, the choice is to send some in available body bags and others in locally available material (as was done this time) or wait for body bags to arrive. Ask the Army personnel who have been serving on the Siachen Glacier what it is to have a dead comrade with you for a few days till a helicopter can come after the weather clears. I will not recount what is done to load a dead body in the small confines of a Cheetah helicopter at posts situated at 18,000 ft and above. The local leadership will, in all cases, decide to use the short flying window available to send back the mortal remains as quickly as possible—body bags or no body bags. This, however, does not detract from the urgent need to immediately equip certain inaccessible posts with something that enhances the dignity of our brave warriors, of every service, who die in the service of the nation. The Army has already stated that what happened was an aberration. It is necessary that people, who have the powers to sanction money and make purchases, work overtime so that dignity in death is never ever violated hereafter. The death of seven brave sons of India should wake us up to this basic need. Officers are good in English but poor in execution. Sir all kudos to the army & air force teams who rescued, transported the mortal remains in the best available manner. I have a problem with why the snaps of these mortal remains were taken in these circumstances and then transmitted in the media. As a force we avoid such remains to be seen even by the families, then how come such a public exhibition? Brought out the facts from his personal experience. Everyone on the far flung posts wants to use limited window available due weather conditions to despatch the mortal remains- body bags or no body bags. No one intends to show disrespect. But yes, a small reminder for those who are in position to clear cases; never ever refuse to approve case which is for honouring the martyrs. Very insightful article sir. We need such an informed perspective, rather than emotional outburst. I agree with AVM M Bahadur. The soldiers at the forward post did the best they could. There’s no question of disrespecting a fallen comrade’s body.